A man has been arrested on suspicion of causing death by dangerous driving and failing to stop at an accident following a fatal collision. The 43-year-old from Ely was arrested yesterday evening, Thursday June 2, after he voluntarily attended Parkside Police Station. He was released on bail to return to Parkside Police Station on August 23. 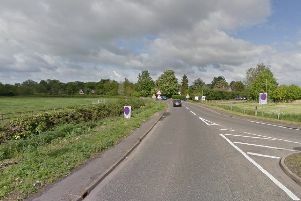 The incident, which involved a blue Ford Focus and a red BMW 325i, happened at around 9.45pm in Littleport on Wednesday, June 1. The front seat passenger who was killed in the collision has been formally identified as Jahmel Rashane Grant, 20, of Grove Road, Rochester Medway, Kent. Another man, the back seat passenger of the BMW, received serious but not life threatening injuries and was taken to Addenbrooke’s Hospital, where he remains in a serious but stable condition. The driver of the Ford and her daughters, aged eight and one, received minor injuries. Anyone who witnessed the collision is asked to contact the road policing unit on 101, quoting incident 560 of June 1.